I wanted to highlight three websites that I keep going back to for information, advice, and wisdom. All bear some relationship to the world of work and careers, sometimes indirectly. More importantly, they give us ideas about how to live with more meaning and even happiness. They’re especially useful for folks in the second half of life who may find themselves more receptive these notions, but I’d recommend them to virtually any adult. 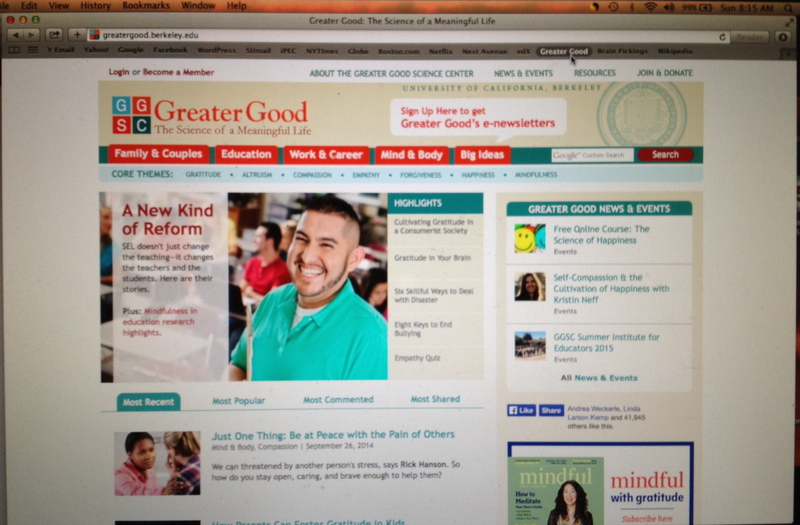 All of have excellent newsletters or e-mail bulletins that you can subscribe to for free. You’re aware that many years of life lie ahead of you and, very likely, you have a different set of expectations for these “bonus years” than you had for earlier adulthood. You sense that you can somehow apply your knowledge and experiences in a meaningful way. Yet you may not know exactly how to achieve this new vision or see all the many possibilities available to you as you navigate the physical, health, work, and financial shifts that inevitably accompany this phase. Enter Next Avenue. We’re a group of public television people and journalists who, for the most part, are experiencing the very same things you are. Like you, we see both challenges and opportunities and we recognize that what we could all use right about now is an abundance of reliable information that can help us figure out what’s, well, next. 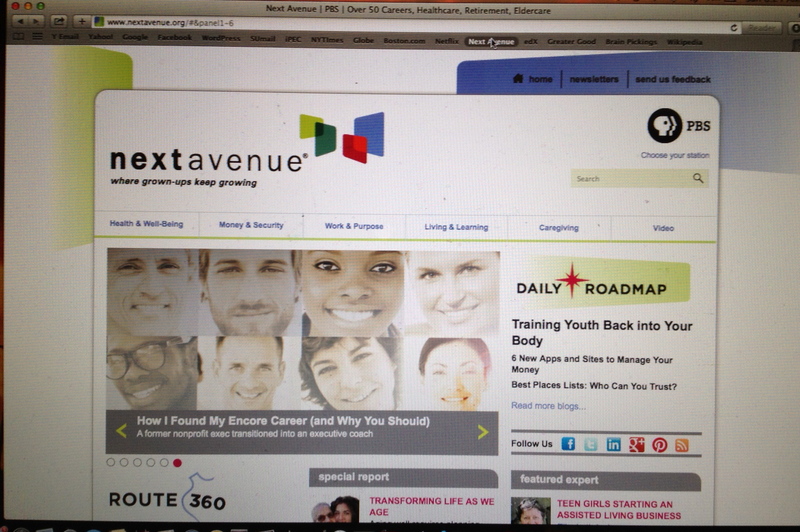 Beyond its home page, Next Avenue has major sections on health & well-being, money & security, work & purpose, living & learning, and caregiving. For me it has become a “go-to” site. is unique in its commitment to both science and practice: not only do we sponsor groundbreaking scientific research into social and emotional well-being, we help people apply this research to their personal and professional lives. Since 2001, we have been at the fore of a new scientific movement to explore the roots of happy and compassionate individuals, strong social bonds, and altruistic behavior—the science of a meaningful life. And we have been without peer in our award-winning efforts to translate and disseminate this science to the public. On this site you’ll find pages devoted to family & couples, education, work & career, mind & body, and Big Ideas. It’s a great example of how academic researchers can translate their findings and insights that inform all of us on how to live better lives. 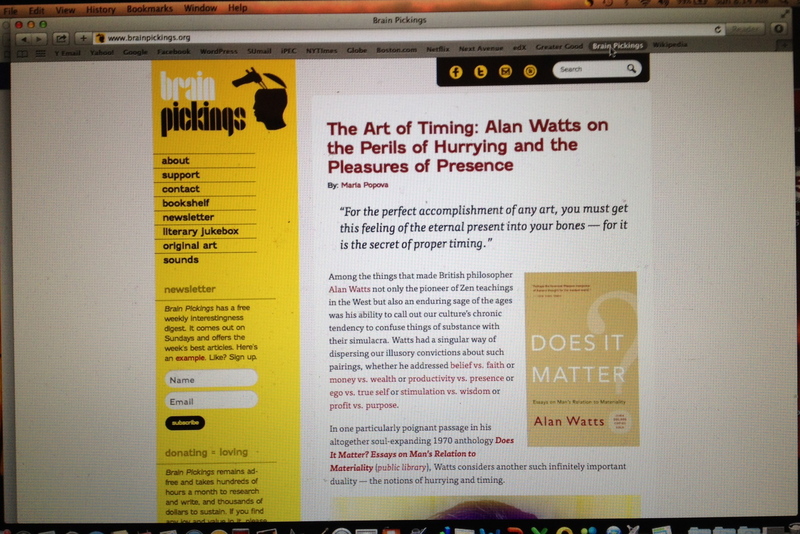 …The core ethos behind Brain Pickings is that creativity is a combinatorial force: it’s our ability to tap into our mental pool of resources — knowledge, insight, information, inspiration, and all the fragments populating our minds — that we’ve accumulated over the years just by being present and alive and awake to the world, and to combine them in extraordinary new ways. In order for us to truly create and contribute to the world, we have to be able to connect countless dots, to cross-pollinate ideas from a wealth of disciplines, to combine and recombine these pieces and build new ideas. Overall, women are 60% of bullying targets and men are 40%. These figures largely affirm previous statistical trends on workplace bullying and gender breakdowns. These factors coalesce into an imperfect storm, whereby women who have been treated poorly or even abusively at work by other women are more likely to perceive the behaviors in very negative and hurtful ways. It may help to explain, for example, why female-dominated professions such as nursing have cultures of incivility — “nurses eat their young” is a well-known quip — grounded in characterizations of “catty” aggression. This also means that women have to be more self-aware of their behaviors than do men, on average. It is unfair that women who mistreat others may be judged more severely than men who act in the same way, but that is an enduring reality. This Article submits that the documented phenomenon of workplace bullying operates to stymie the retention and advancement of women in the workplace. . . . This Article adds a new dimension . . . by viewing workplace bullying through the lens of gender discrimination, albeit perhaps unwitting gender discrimination. It explores the disparate impact doctrine of liability and examines how its rationale, ideological underpinnings, framework, and viability as a vehicle might look against the backdrop of workplace bullying. . . . In addition to contemplating possible uses of Title VII, this Article examines proposed state statutes, and posits the possible creation of a federal agency to deal with the problem in a manner that may not implicate a private right of action. It is only through increased awareness and renewed discussion of all of the discriminatory ramifications of bullying, that this last bastion of legally protected workplace abuse, which typically occurs behind closed doors and whose effects are too often obscured, will be stopped. But I’ll place a heavy bet that these lines are directed at a lot more women than men, including in the workplace. They are meant to plant seeds of self-doubt that add to the crazy-making dynamics of being bullied, at times with a big dose of discriminatory intent. The e-mail chain you were left off of…the meeting you weren’t included in…the lunch at the club you weren’t invited to…You’re so sensitive. You’re so emotional. You’re defensive. You’re overreacting. Of course, this is just the comparatively minor stuff. If you’ve seen more harrowing, malicious forms of gaslighting related to work — sabotage, stalking, electronic harassment, and so forth — you know what I mean. This can be among the most vicious of bullying tactics. Membership in any demographic group will not shield one from the realities of today’s workplace and economy. After all, plenty of white males with families and homes in the ‘burbs have experienced difficult work environments and unemployment. But when you start pulling together information about who is targeted for bullying at work and who is suffering financial distress, single women start to emerge as an especially vulnerable group. To readers following this blog for any length of time, it’s no secret that I frequently write about the so-called dark side of work: Workplace bullying, mobbing, and harassment get a lot of attention here, and it’s the primary cluster of topics that leads people here via search engines. We’re still learning about the impact and costs of these forms of interpersonal abuse, and I’m committed to discussing them. However, we also must apply our insights on these destructive behaviors to the broad objectives of creating better workplaces and treating workers with dignity. Sometimes our perspectives on work are split between more abusive, exploitative employment practices and more positive, wellness-oriented behaviors. At times, for example, I’ve sensed some distance with folks who favor a positive psychology perspective on employee relations; they may see my emphasis on workplace bullying and related topics as being immersed in the negative, to a point of excess. However, when I write pieces coming from a more positive, solution-oriented perspective, I may feel resistance from those who are steeped in hurtful workplace behaviors, with an underlying message that I’m being overly sunny. The bottom line is that we need to understand the light and dark sides of work in order to be effective change agents. If we don’t acknowledge that psychopaths, almost psychopaths, and narcissists constitute a narrow but sizable and destructive bandwidth of CEOs and managers, then we often will be blind to the darkness coming out of certain corner offices and boardrooms. If we overlook the possibilities of creating healthy, even (yes) happy job situations and of transcending debilitating fight-or-flight work environments, then we often will find ourselves stuck in a dark place for an extended period of time. It’s about balance and integration, yes? For my part, I’ll do my best to examine destructive behaviors at work and their impact on workers and organizations, while also highlighting how organizational change, law reform, and individual and social change can lead us to better, more dignified workplaces and work experiences. We’ve got a lot of work to do, and understanding the bigger picture, with all its possibilities and limitations, is a good starting point. Earlier this week, California Gov. Jerry Brown signed legislation (Assembly Bill No. 2053) requiring employers of 50 or more workers to engage in training and education for supervisors concerning workplace bullying. …conduct of an employer or employee in the workplace, with malice, that a reasonable person would find hostile, offensive, and unrelated to an employer’s legitimate business interests. Abusive conduct may include repeated infliction of verbal abuse, such as the use of derogatory remarks, insults, and epithets, verbal or physical conduct that a reasonable person would find threatening, intimidating, or humiliating, or the gratuitous sabotage or undermining of a person’s work performance. A single act shall not constitute abusive conduct, unless especially severe and egregious. The California law does not, however, create a legal claim for workplace bullying. Nevertheless, it is an important step forward and constitutes further recognition of the need for our legal system to respond to workplace bullying. This law follows legislation enacted by Tennessee earlier this year directing a state commission to develop a model workplace anti-bullying policy for the state’s public employers. I’ll have more to say about these developments in a later post.